Taking an inexpensive $15 mint green cardigan sweater from Target’s new Cat & Jack line, I added flat back glass 3mm crystal rhinestones using the Crystal Katana pick up tool and Beacon Gem-Tac glue. 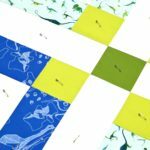 In this edition of the Sewing Report, watch Jen baste the Retro Plaid Quilt – designed by SuzyQuilts.com for Birch Fabrics. 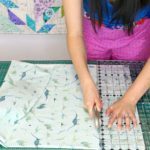 Nervous for cutting into your fabric for a sewing or quilting project? 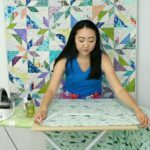 Never fear – Sewing Report demonstrates how to use a rotary cutter and quilting ruler to cut strips and shapes on a self-healing cutting mat. Before getting into a sewing or quilting project, it’s important to properly press your fabric. In this video, Sewing Report demonstrates how to iron fabric from the bolt.